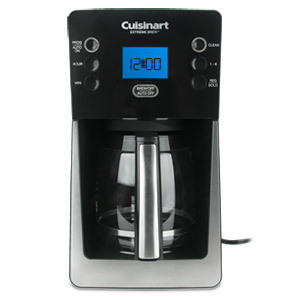 The Cuisinart Perfect Brew DCC-2850FR 12 cup refurbished coffee maker in black/silver color, has carafe that is thermal insulated to retain the hotness and freshness. During sudden power loss, the 60 sec reset recalls the position of brewing process. It features brew strength controller to choose either bold or regular flavor. This state-of-the-art coffee maker automatically turns up the temperature to deliver hotter coffee while retaining coffee's full flavor and quality throughout the brewing process.